If I had to choose just one tool in my kitchen to keep it would either be my Vitamix, or my Instant Pot… hard to choose, but the point is, the I-Pot is right up there! Whether you become a complete I-Pot aficionado, or you use it as a way to keep your flow of essential meal components steady, in my humble opinion, this tool is one of the keys to making healthy plant-based eating easier and faster — and cheaper, too. (By the way, I’m not getting paid by anyone to say any of this). Last night I co-hosted a Meatless Monday I-Pot demo with Ecossentials, a local no-waste bulk food store, and we had a great turnout! This was a promotional event for Powell River’s Meatless Monday campaign, which aims to raise highlight and raise awareness about the environmental impact of our food choices. Please join the campaign so we can show the impact people who are choosing meatless meals in Powell River are making! You can do so here. 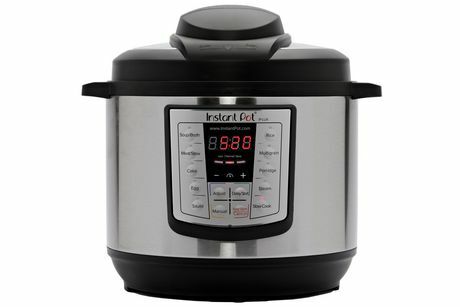 A lot of people are intimidated by pressure cookers, and our goal was to allay some of those fears, and I think we did! We were so busy we forgot to take pictures, but I promised to post the recipes we made, along with a few follow-up resources, so here goes. 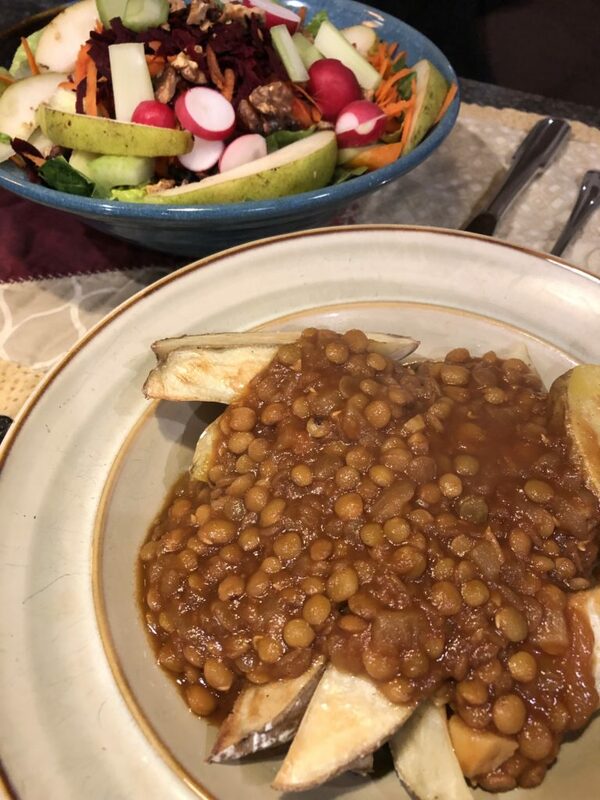 The first recipe we did was BBQ Lentils, which is adapted from Jill McKeever’s instant pot cookbook O M Gee Good! These BBQ Lentils are delicious served over oven baked fries — and with a side salad they make a great fast, nutritious Meatless Monday (or any day!) meal. Place lentils, water, onion and garlic in the IP inner pot. Cover with lid, and lock in place. Align the pointed end of the steam release handle to sealing. Press Manual – use [-] button to adjust cooking time to 10 minutes. Once the pot has come up to pressure and the 10 minutes have counted down, press the cancel button and carefully slide the steam release handle to the venting position to let out steam until float valve drops down. Remove lid. Add ketchup, molasses and liquid smoke to lentils. Press saute, and simmer until the dish has thickened to your liking. Serve immediately, or cool and freeze in meal-sized portions. 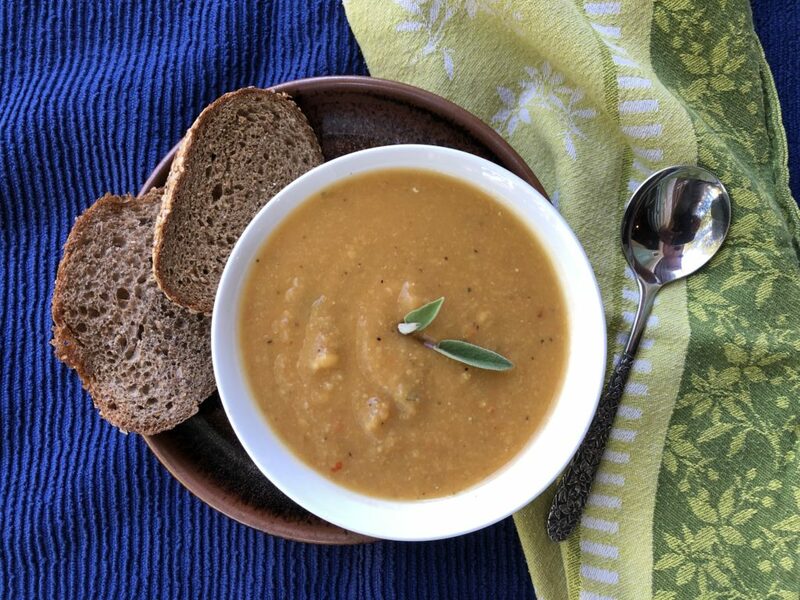 For more vegan I-Pot recipes from Jill, check out her Youtube Channel here. Turn the saute function of the instant pot on, and when the pot starts to get hot add the onion and saute for a couple of minutes, until the onions become translucent. Add garlic, carrots, celery, chile flakes, and bay leaves and saute for a couple of minutes more. Add ancho chile pepper, 2 tbsp of the sage, the peas, and the vegetable stock. Turn the saute function off and secure the lid the instant pot. Using the manual setting set the pot to pressure cook for 20 minutes. Once the 20 minutes have finished, turn the pot off and allow the pressure to release naturally. Open the lid, remove the ancho chile and bay leaves and blend the soup, adding the final tbsp of sage, liquid smoke, and the salt and pepper. Enjoy!